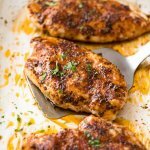 My tips for a truly juicy, Oven Baked Chicken Breast: a touch of brown sugar in the seasoning which makes the chicken sweat while it bakes so it creates a semi "sauce", and cooking fast on a high temp! Go by the colour of the crust to know when it's baked. Pictured with this Garlic Butter Kale Rice. Preheat oven to 425F/220C (standard) or 390F/200C (fan / convection). Pound chicken to 1.5cm / 0.6" at the thickest part - using a rolling pin, meat mallet or even your fist (key tip for even cooking + tender chicken). Line tray with foil and baking paper (sugar caramelises, it's annoying to clean off tray). Place chicken upside down on tray. Drizzle chicken with about 1 tsp oil. Rub over with fingers. Sprinkle with Seasoning. Flip chicken. Drizzle with 1 tsp oil, rub with fingers, sprinkle with Seasoning, being careful to cover as much of the surface area as you can. Bake 18 minutes, or until surface is golden per photos and video, or internal temperature is 165F/75C using a meat thermometer. 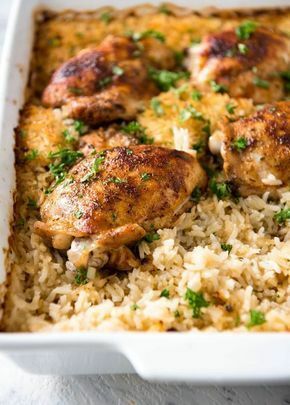 Remove from oven and immediately transfer chicken to serving plates. Wait 3 - 5 minutes before serving, garnished with freshly chopped parsley if desired. Pictured with a side of Garlic Butter Rice with Kale. 1. If your breast is quite large eg 250g / 8oz+ each, cut them in half horizontally to form 2 thin steaks and skip the pounding. Make sure they are no thicker than 1.5cm / 0.6" thick at the thickest point - if they are, pound using fist. 0 Response to "Oven Baked Chicken Breast"